During my deep dive session on document and records management with Mike Fortgens (@MikeFortgens) last week we got a bit confused about the fact that SharePoint 2010 has a Keywords site column and an Enterprise Keywords site column. The Keywords site column is stored in the “Core Document Columns” category and is of the “Multiple Lines of Text” type. 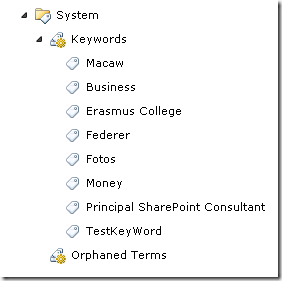 The Enterprise Keywords column is stored in the “Enterprise Keywords Group” category and is of the “Managed Metadata” type. 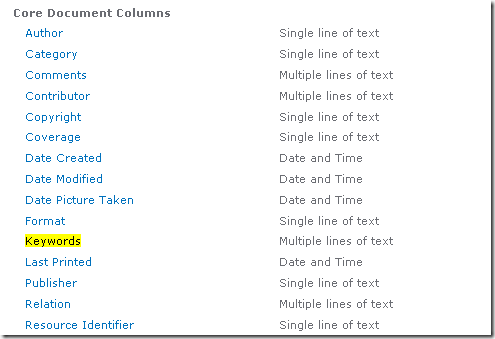 The last column is what you would expect in SharePoint 2010, it’s the site column that stores it’s contents in the Keywords term set in the Managed Metadata Service Application. So what does the other Keywords column do? Adding the column to the list shows you can manually enter values in the column, but that it won’t store the values in the Keywords term set in the term store. However adding both the Keywords and the Enterprise Keywords columns to a list has some unexpected behavior. Keywords that are added to the Enterprise Keywords column are also copied to the Keywords column and visa versa. It turns out that this is actually expected behavior to support an easy upgrade from the old 2007 Keywords field (of the Multiple Lines of Text type) to the new Enterprise Keywords field (of the Managed Metadata Type). The synchronization behavior is automatically enabled as soon as the Enterprise Keywords field is added to a list or library. It’s even described on the “Enterprise Metadata and Keywords Settings” page in the Library settings.